Italian sausage is a versatile and tasty basis for any meal. 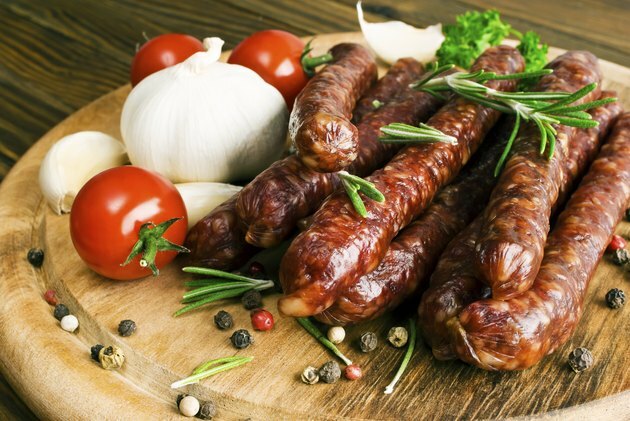 Traditional Italian sausage contains pork and sometimes veal, but if you are looking for a low-fat alternative, turkey Italian sausage is also available. Cooking Italian sausage is not difficult. Pan-frying it and then braising it in sauce ensures that the sausage cooks through without scorching the casing or drying out the ground filling. Use an instant-read thermometer to make sure the sausage is safely done. Heat a large skillet over medium heat for 45 seconds to one minute. Coat the bottom of the skillet with olive oil and let it heat just until you can smell the oil. Add your Italian sausages. Stand back because sometimes they spit and splatter when they touch the hot oil. Cook the sausages for three to five minutes, turning them with tongs rather than a fork to keep from puncturing them. Add just enough tomato sauce to the skillet to cover the bottom when the sausages are cooked on all sides. Turn the heat to low and cover the skillet. Cook the sausages for at least 30 minutes. Insert an instant-read thermometer into the center of the thickest sausage, making sure not to poke it through to the hot pan. Prok sausages are done at 160 degrees Fahrenheit; turkey sausages are ready at 165 degrees Fahrenheit. Add julienned peppers and onion to the pan while the sausage is frying for a quick and simple sandwich filling. Always rely on the thermometer reading to determine the internal temperature of the sausage.